GST is a non-discriminatory tax, and its effect will be seen across verticals. In this article, we will look at the effects of the new tax on the hospitality and tourism industry. The Indian hospitality and tourism industry, which was pegged at US$ 136.2 billion at the end of 2016, is one of the sectors which will see major changes post-July. Experts observe that the implementation of GST will help the sector by reducing costs for customers, harmonizing taxes, and reducing business transaction costs, but will also have its own set of challenges. The hospitality industry, like every other sector in the Indian economy, was liable to pay multiple taxes (VAT, luxury tax, and service tax) under the previous VAT regime. A hotel where the room tariff exceeded INR 1,000, was liable for service tax at 15 percent. An abatement of 40% was allowed on the tariff value, thus bringing the effective rate of service tax down to 9%. The Value Added Tax (ranging between 12 percent to 14.5 percent) and luxury tax, would apply on top of this. However, for restaurants, there was 60% abatement which meant that the service tax was charged at an effective rate of 6% on the F&B bills, apart from VAT (12 percent to 14.5%). Bills for bundled services like social functions (seminars, marriage etc. ), were taxed with an abatement of 30%. The cascading effect of the VAT regime where the end consumer paid a tax on tax, increases the end cost. Hoteliers and hospitality businesses did not get any input tax credit on the taxes they paid, as central taxes like service tax, could not be set off against state taxes (VAT) and vice-versa. GST will abolish several other taxes, leading to a reduction in procedural steps and more chances to streamline the taxation process. It was sometimes difficult to differentiate between a Value Added Tax and an entertainment tax for the common man. However, under the GST regime customers will see only a single charge on their bill and it would give them a clear picture of the tax they are paying. How many times have you had to wait in the hotel lobby wondering if you would miss your flight back home because your bill was still being prepared? With just one tax to compute, the checking-out process at hotels and restaurants will now become easier – another perk that the hospitality industry can brag about. The tourism and hospitality industry will find it easier to claim and avail input tax credit (ITC) and will get full ITC on their inputs. Before GST, the tax paid on inputs (raw edibles for food, cleaning supplies etc.) could not be adjusted against the output without any complications. However, this will become easier in the GST regime. When the service tax was first introduced, there were a lot of mix ups. GST, thankfully, has very clear guidelines on how each industry needs to manage their accounts and file returns but it will require businesses to become technologically adept, increasing the technological burden and cost for compliance. 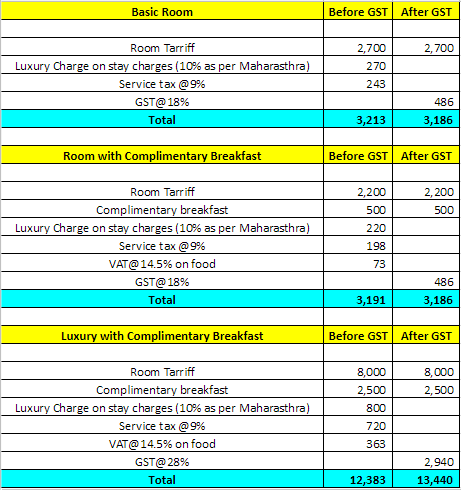 In Maharashtra, for instance, hotel rooms were earlier taxed at 19% and food and beverage at 18.5%. Even with GST charged at 18%, there is only a minimal cost reduction in both cases. Businesses will also look to recover the additional cost of technology and new systems from their customers, which might – in some instances – lead to higher tariffs. As India becomes an even bigger player in the global hospitality and tourism industry, we need services to be at par with global rates. Our Asian neighbors such as Japan and Singapore have very low tax rates for their hospitality sector (8% and 7% respectively) which is an important reason for them ranking high on tourist wishlists. India is a global tourism hotspot, but it still loses out on the backpacker crowd due to these high rates. GST is a mixed bag of better and easier rules and regulations, and increased costs and compliances. The Hotel and Restaurant Association of Western India had been lobbying for a GST rate of 5% as it believed that a lower rate will bring in more tourists and allow Indian businesses to compete with global chains. However, the GST Council deemed it fit to set the rate at 18%. The Tourism and Hospitality industry in India is expected to grow to US$ 280.5 billion by 2026, and the initial hiccups after GST implementation are highly unlikely to impede this growth. However, it remains to be seen whether the cons outweigh the pros for this sector.